My previous post shows that I find myself increasingly making random time-lapse sequences of the night sky using wide-angle lenses. These produce a record of satellites, meteors and anything else passing by that emits or reflects light. As the results are less astronomical in nature rather than publish them here I have made another blog devoted to the more interesting results obtained. 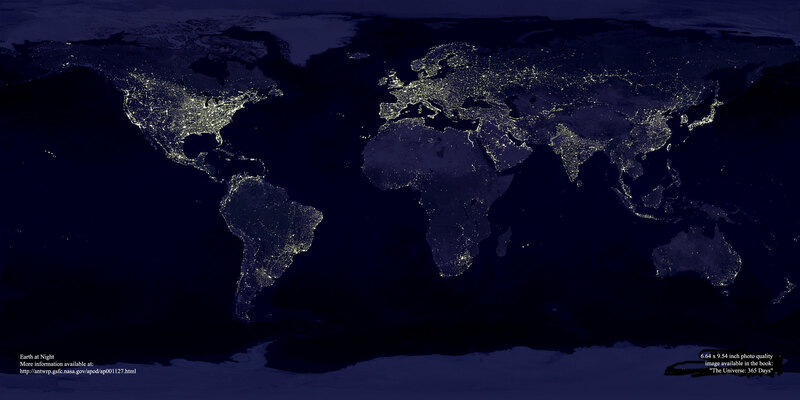 This satellite signs off with a flash on this time lapse animation. Details: animated gif 2.23 mb. Canon 450D. Takumar 28mm lens @ f3.5. iso 1600. exposure 20 seconds per frame. Processed with FIV. 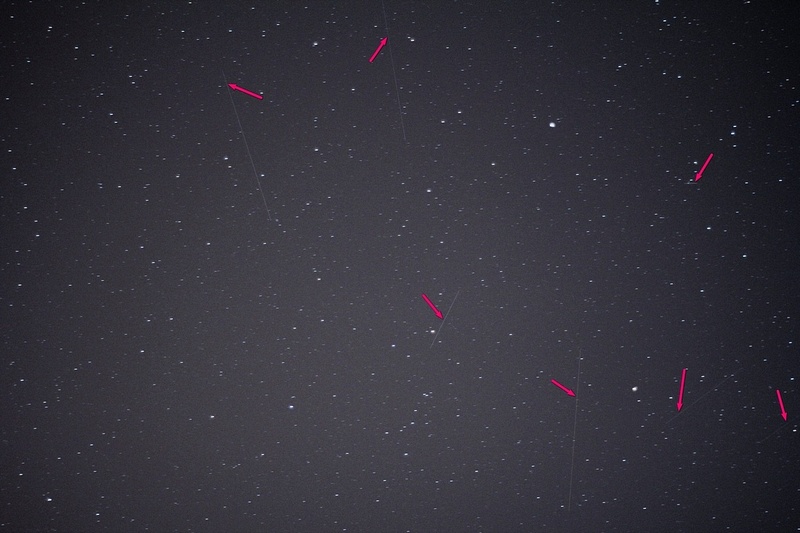 While experimenting with some time lapse sequences this single unguided 15 second exposure picked up no less than 7 trails from satellites or space junk. 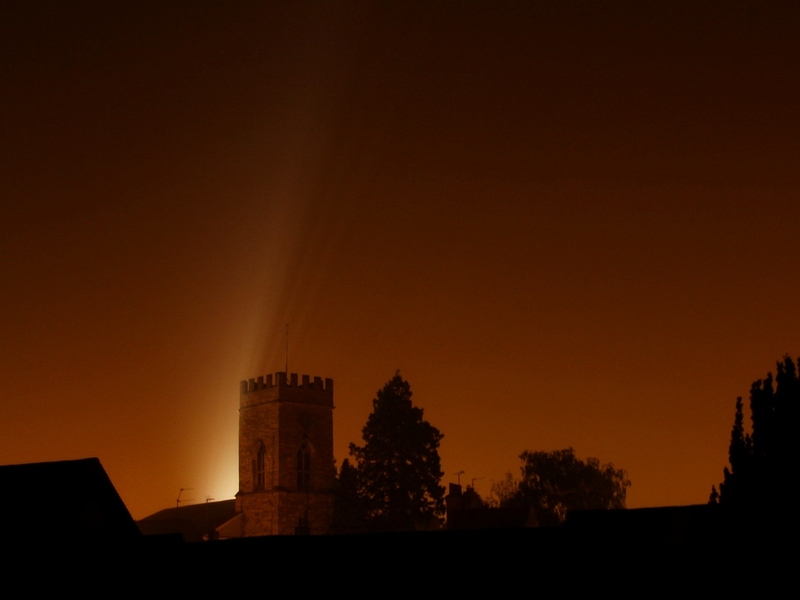 This is with a 55mm lens on an APS-C sensor so covers a fair area of sky. Evidence though of the large amount of man-made hardware that can find its way onto our astro images. Details: 55mm @ F1.8 Canon 550D 15 seconds exposure. No filters. Processed with FIV. At last a windless evening with some clarity and a temperature that was agreeable to opening the observatory. With it being my first attempt at some imaging since early December my main concern for the session was that everything was still working OK after the lengthy period of inactivity. 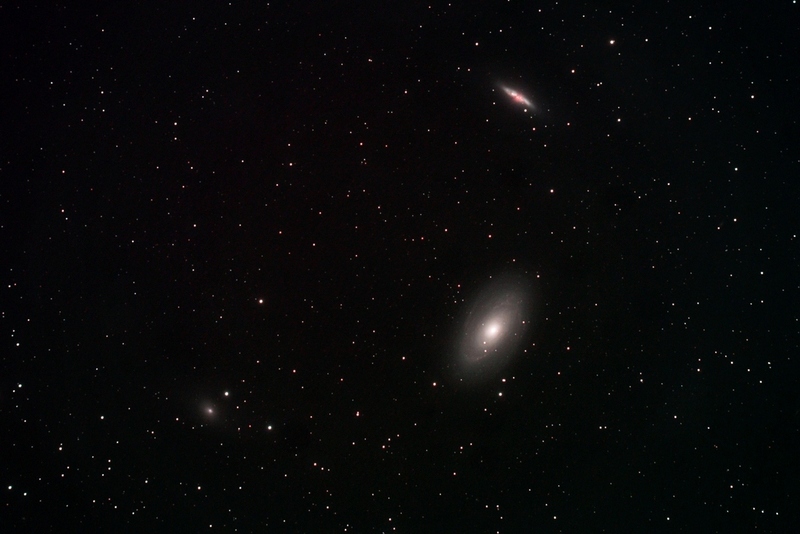 I decided on the M 81 group in Ursa Major as I hadn't imaged the trio before with the apo. Much to my relief there were no problems with equipment apart from a bit of reluctance with the guidescope to run its calibration routine. However it soon resolved itself and I was up and running again under a nicely transparent sky. 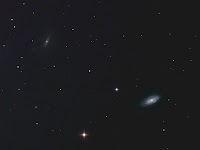 As well as the bright M 81 at top is M 82 and lower left is the fainter NGC 3077. Details: Megrez 88 apo. 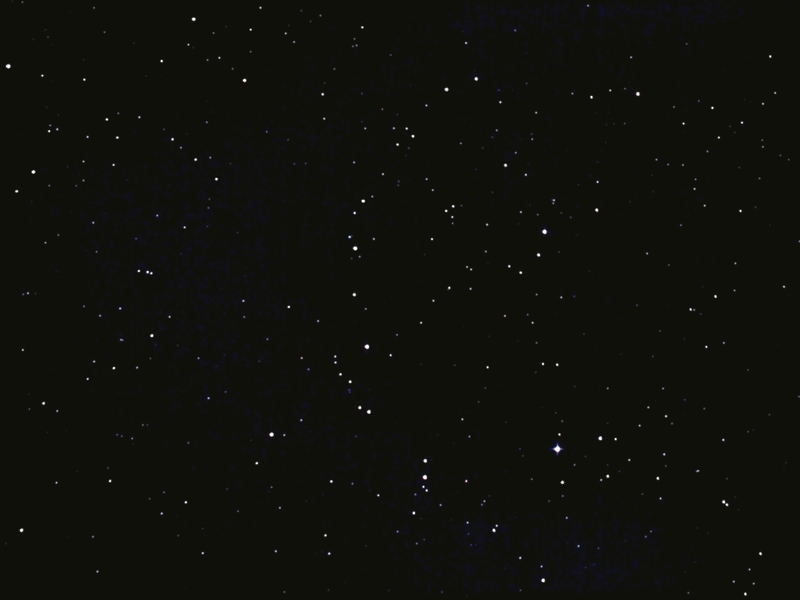 10 x 10 minute exposures @ iso1600 with CLS in DSS, FIV, CS2 & XAT. After the least astronomy friendly winter I can remember with a total lack of clear skies and a wealth of cold and windy weather the inspiration to do any astrophotography has been almost totally absent. With signs of spring now grudgingly appearing I'm feeling more inclined to slide off the observatory roof if an opportunity arises to do some imaging. During my last session back in early December 2012 I took the subs for the open cluster NGC 1245 but never finished processing them so at last I have got round to producing a new image for the blog in an effort to revive my enthusiasm now we return to the galaxy laden skies of spring. 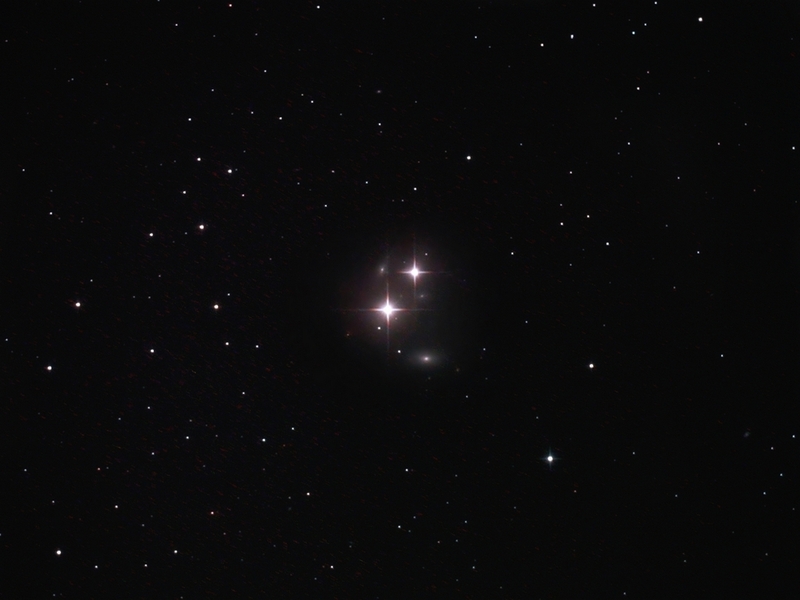 At mag.8.4 and with some nice star chains NGC 1245 lies in Perseus. Details: Megrez 88 apo. 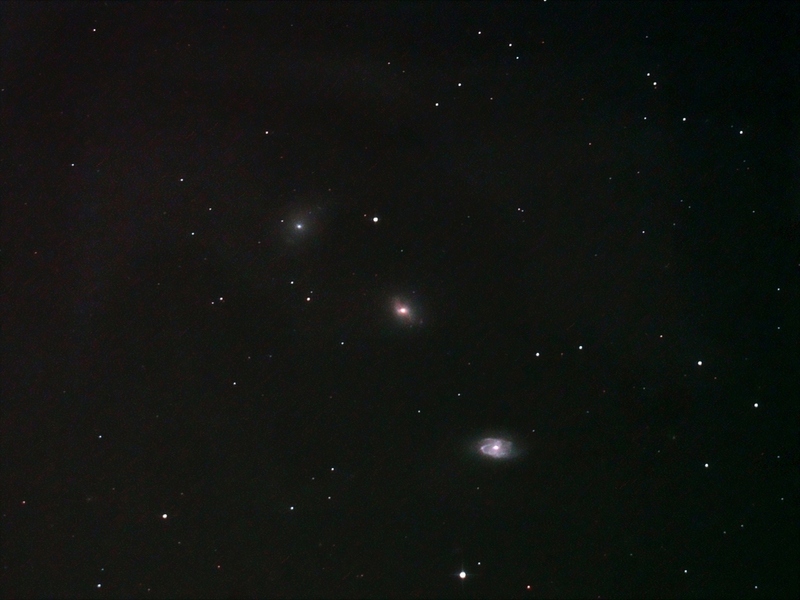 10 x 8 minute exposures @ iso1600 with CLS in DSS, FIV, CS2 & XAT. It was becoming a long time since my equipment had any use so once a clear spell arrived I resolved to give it a check to see if all still worked OK. Once again the town's Christmas illuminations have been switched on so any attempt would be affected by the annual period of added broadband illumination.....I noticed I have never really made much of an attempt on M 33 in Triangulum so I decided to give it a try with the apo. The first sub revealed the usual washed-out appearance the festive lights inflict on any images. I may have mentioned before that the added pollution isn't that apparent to the naked eye but is very obvious to the camera. The resulting stack was quite disappointing so the processing had to be forced more than I would have liked to make much of the subject. Details: Megrez 88 apo. 15 x 8 minute exposures @ iso1600 with CLS in DSS, FIV, CS2 & XAT. Remaining in Pegasus the next clear opportunity attracted me to this condensed area of galaxies containing a number of NGCs. Not the most spectacular of images but the number of galaxies now detectable with modest equipment under the light polluted skies of Milton Keynes keeps surprising me. When the clouds eventually cleared transparency remained good throughout the session. Details: 10" f4.3 Newt. 12 x 10 minute exposures @ iso1600 with CLS in DSS, FIV, CS2 & XAT. An unexpected clear spell gave me a chance to try for an image of Comet 168P/Hergenrother passing through the Square of Pegasus. Although cloud brought the session to a premature halt I did manage to obtain almost 2 hours worth of subs. An unexpected brightening had taken it to nearly magnitude 9..... I managed to make a video from the subs but with only 28 frames it is rather brief. Details: 10" f4.3 Newt. 28 x 4 minute exposures @ iso1600 with CLS in DSS, FIV, CS2. Video made with VirtualDub. For this subject I had to abandon two sessions when they were afflicted by continual patches of thin cloud passing by and ruining any chances of a decent set of subs. The third attempt proved more productive though the transparency could have been better. 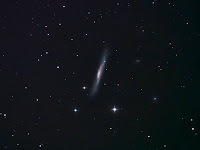 This is another of the brighter galaxies in Pegasus. It is the barred-spiral NGC 7479 and is notable for its sinuous arms though I haven't been very successful at capturing them as well as I had hoped. Perhaps another one for a better sky. Details: 10" f4.3 Newt. 15 x 10 minute exposures @ iso1600 with CLS in DSS, FIV, CS2 & XAT. A bright high moon prevented any DS imaging on the next clear evenings to arrive. Eventually it became late enough in rising to attempt an image. Pegasus contains a good many galaxies though most are at the limit of my equipment's capabilities. I thought this pair of NGCs were worth recording and I managed to obtain a set of subs before the moon became a factor. 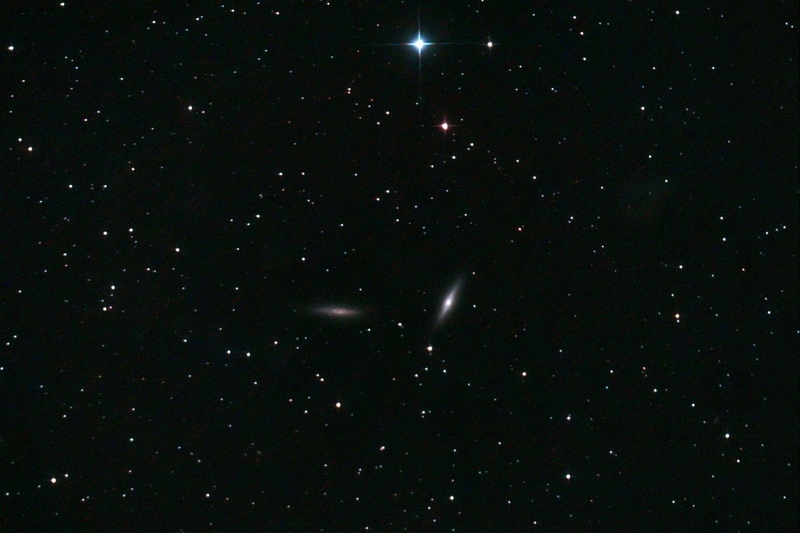 On the left is NGC 7339 with 7332 to the right. Details: 10" f4.3 Newt. 15 x 7 minute exposures @ iso1600 with CLS in DSS, FIV, CS2 & XAT. This session proved a bit challenging as patches of thin cloud made spells of decent transparency a lengthy wait at times. 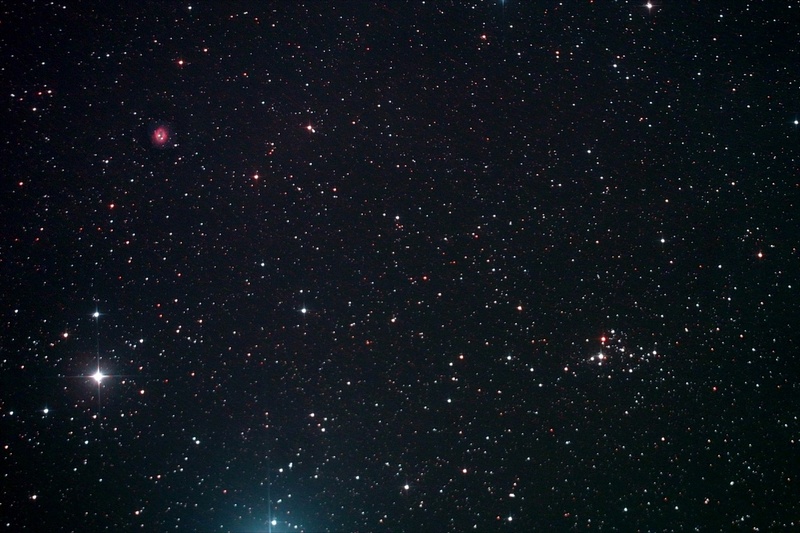 On the look out for something new to image I came across this pair of objects in Cepheus. Back to the Newtonian for this one as both objects are very small. I'm still not certain of an identity for the small nebula at upper left (RA 22.16 Dec 57.28). 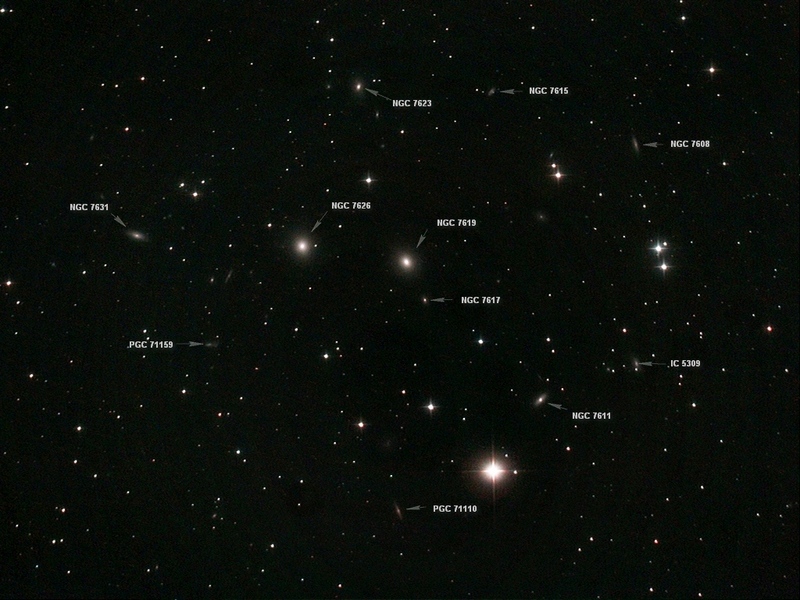 The attractive cluster lower right is NGC 7235. The glow at bottom is from the 4th magnitude Epsilon Cephei (Phicares). Details: 10" f4.3 Newt. 15 x 7 minute exposures @ iso1600 with CLS in DSS, FIV, CS2 & XAT. It has an apparent magnitude of 13.50. The next session was a bit cooler and the transparency remained somewhat variable but fairly good. This time I tried for a pair of adjacent NGC objects in Cepheus. 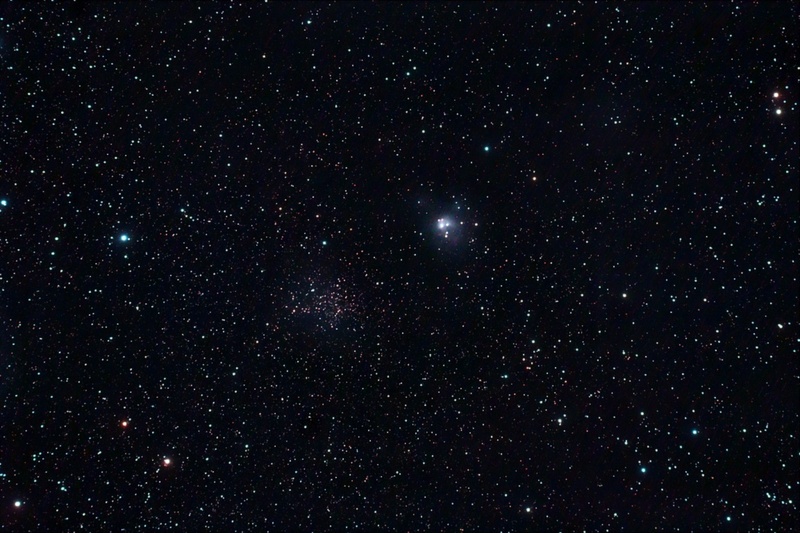 The open cluster is NGC 7142 and the reflection nebula is NGC 7129. 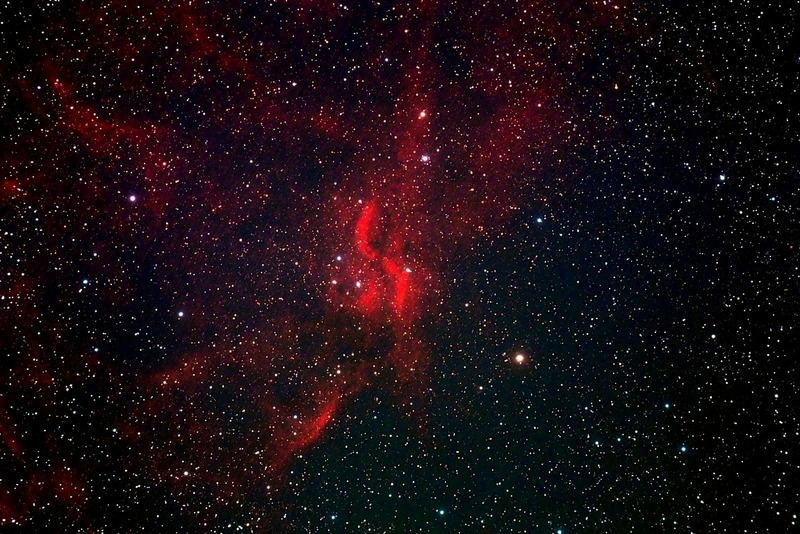 The open cluster is believed to be partially obscured by the dust clouds associated with the nebula which itself is illuminated by a small cluster of very young stars. Details: Megrez 88 apo. 15 x 10 minute exposures @ iso1600 with CLS in DSS, FIV, CS2 & XAT. A bit of a wait for the next clear opportunity which arrived during a hot spell of weather so a very balmy evening to do some imaging. Useable subs are now available at an earlier time so matchsticks aren't quite so neccessary as we move into the autumn months. 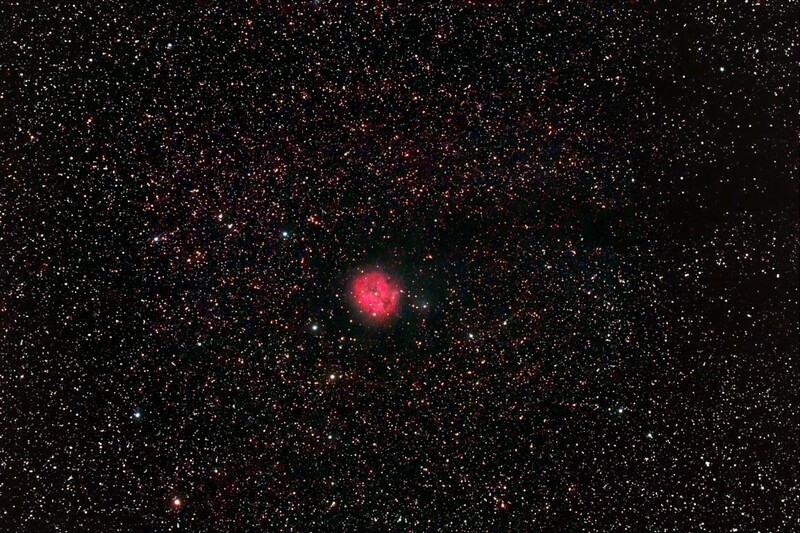 With the camera still on the apo I went for a wider image of one of my favourite objects - The Cocoon Nebula (IC 5146) which sits nicely isolated in Cygnus. The associated dust lane (Barnard 168) gives it a unique appearance. Transparency varied throughout the session but was generally quite good. Details: Megrez 88 apo. 15 x 10 minute exposures @ iso1600 with CLS in DSS, FIV, CS2 & XAT. Clear nights seem much like buses....you wait for ever then an abundance arrives. The next clear evening maintained the decent transparency of the previous 2 sessions. 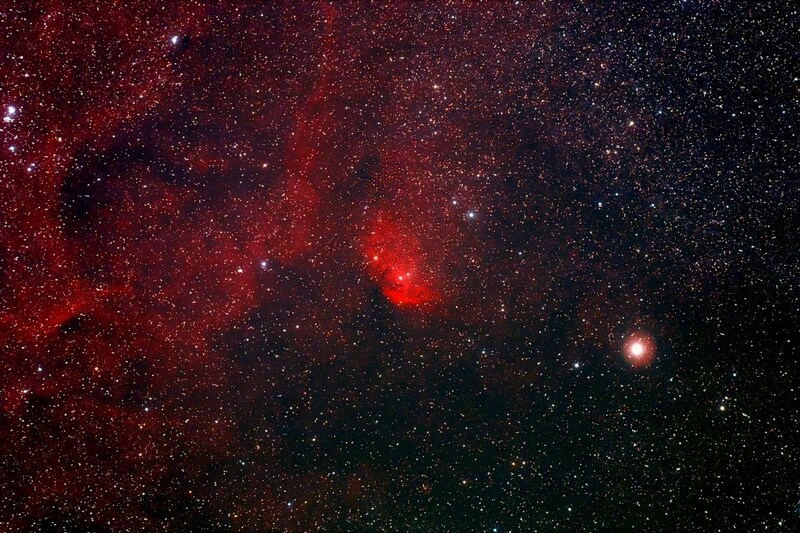 Carrying on with the apo I went for the unusual Propeller Nebula (DWB 111) in Cygnus. 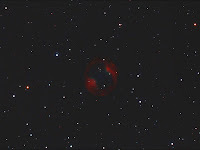 Little appears to be known about this peculiar emission object regarding its mode of formation or distance from earth. Details: Megrez 88 apo. 15 x 10 minute exposures @ iso1600 with CLS in DSS, FIV, CS2 & XAT. 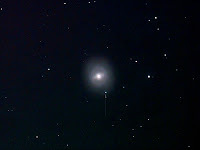 With the clear spell continuing the next evening found me looking for a nebulous target to image. With the apo still set up I decided on a wide view of Sh2-101 (The Tulip Nebula) which glows from behind a dense dust cloud in Cygnus. Now a month after the solstice it is still past 11.30 pm before it is dark enough to obtain useable subs. Details: Megrez 88 apo. 15 x 10 minute exposures @ iso1600 with CLS in DSS, FIV, CS2 & XAT. After one of the longest periods of astrophotography downtime since I started this blog a spell of high pressure produced a long awaited clear sky. Not having fired up my system for such an extended period it was a relief to find that everything still seemed to be working OK. 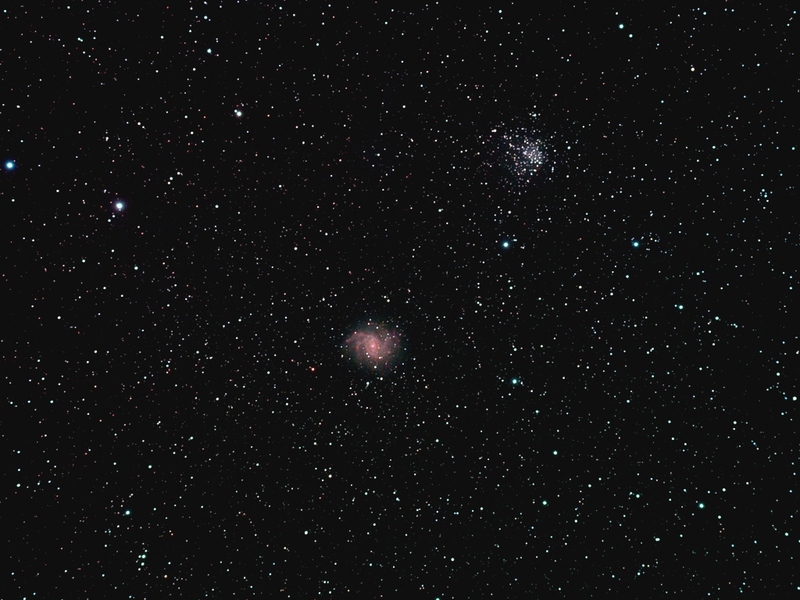 Though we are now well into the summer constellations and the more nebulous targets I still found myself looking for galaxies..... NGC 6946 (The Fireworks Galaxy) and open cluster NGC 6939 are very close together right on the border of Cygnus and Cepheus. 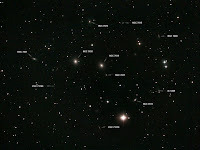 The galaxy being in Cygnus and the cluster in Cepheus. I needed the wider field of the apo to get them nicely together. The transparency remained quite good throughout the session. Details: Megrez 88 apo. 15 x 10 minute exposures @ iso1600 with CLS in DSS, FIV, CS2 & XAT. With the continuing period of weather inflicted downtime and lack of anything to post I thought I would make an animated gif to better reveal the star movement mentioned in my post of 28.5.12 regarding the NGC 5966 group of galaxies. This shows the amount of movement since 1994. Nights suitable for any imaging are being very elusive again. Meanwhile the church tower received some additional illumination when one of the many beacons to celebrate The Queen's Diamond Jubilee appeared on top. My next session wasn't so bedtime restricted so I went for something a bit deeper. 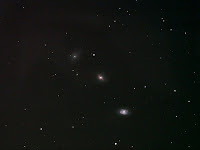 This small group of stars and galaxies in Bootes made an attractive target. 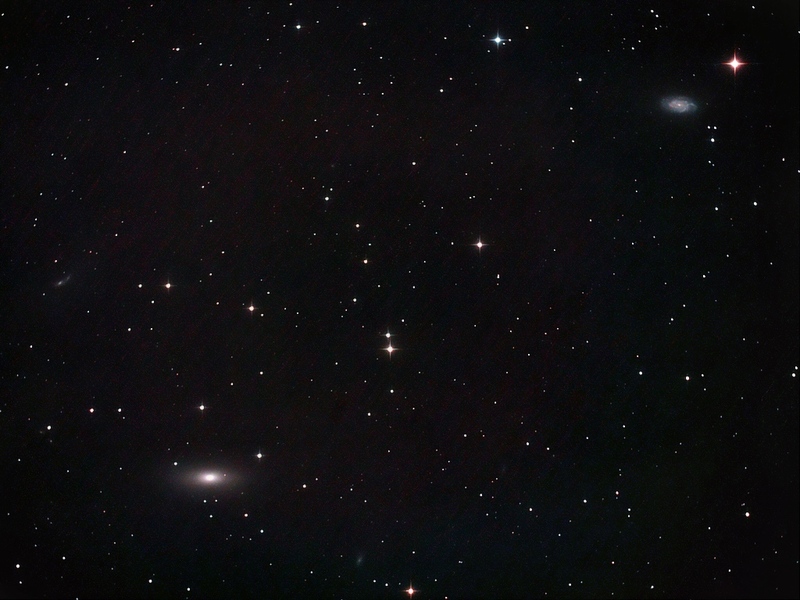 The galaxy lower right is NGC 5966 and that at upper left is IC 4563. 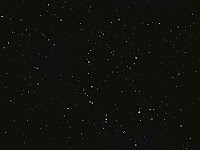 The two bright stars are HD 139341 (left) & HD 139323 (right). It is interesting to look at this informative image of the group and note the amount of movement (left to right) the pair of stars have made since 1994 ( the date of the DSS survey plate used). My own image required a lot of processing to remove the excessive noise which resulted from the high ambient temperature (Makes you realize the benefits of a dedicated cooled camera). Details: 10" f4.3 Newt. 12 x 8 minute exposures @ iso1600 with CLS in DSS, FIV, CS2 & XAT. When the next clear night arose other commitments meant an early night was expedient so I wasn't able to image into the early hours required at this time of year. 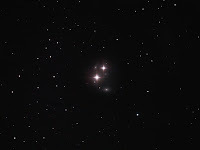 I've always found star chains fascinating and had spotted this nice example in Serpens while galaxy hunting. With only short exposures required it made a quick target for the session. Details: 10" f4.3 Newt. 10 x 4 minute exposures @ iso1600 with CLS in DSS, FIV, CS2 & XAT. Although the past few days have been sunny and warm the sky clarity during the evenings hasn't been amenable to any serious imaging. However, I did notice that last night provided a good view of the often mentioned church tower floodlighting so I include a photo to show how my sky is frequently compromised at higher elevations. With persistent cloudy nights it seemed a long wait for the next clear opportunity. The moon had come and gone before any galaxy hunting could be resumed and with the onset of summer evenings a dark sky was becoming a long wait . By now Virgo had moved into my window so this pair of NGCs were added to the list. The nearby bright star is 109Vir @ mag.3.7. The galaxies are NGC 5746 (top) & NGC 5740 (bottom). Details: 10" f4.3 Newt. 15 x 8 minute exposures @ iso1600 with CLS in DSS, FIV, CS2 & XAT. 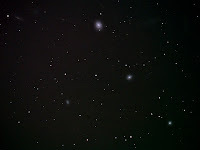 After NGC 4559 the following evening was also clear with good transparency. 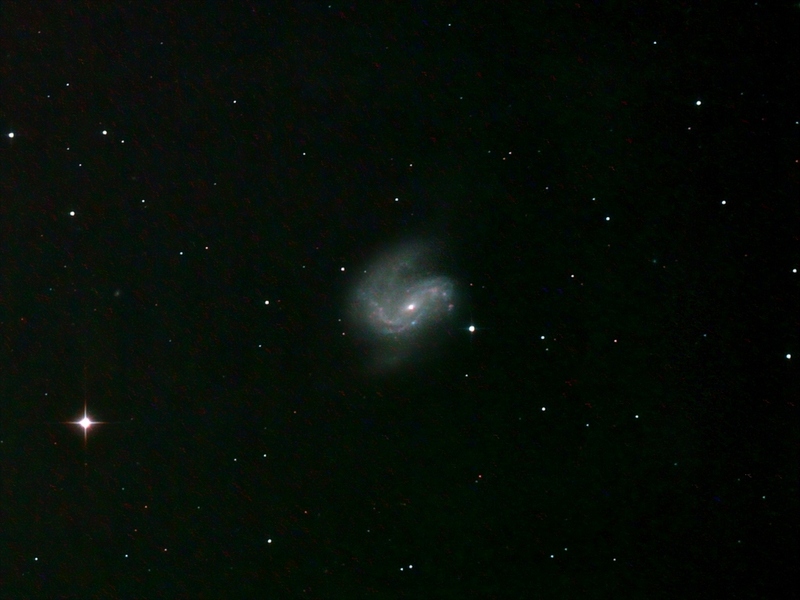 As a change from NGCs I found a Messier galaxy that I hadn't previously imaged. 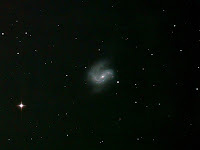 It is M 99 in Coma Berenices. At a distance of 50 million light years it has accounted for 3 supernovae. Details: 10" f4.3 Newt. 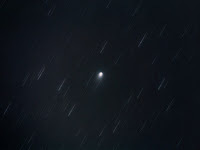 15 x 10 minute exposures @ iso1600 with CLS in DSS, FIV, CS2 & XAT. 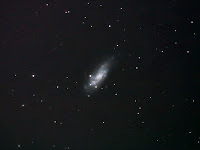 It seemed a long wait for the next imaging opportunity with a long run of cloudy nights. 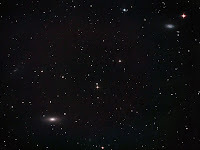 Meanwhile the moon had ceased to be a factor so the hunt for galaxies could resume once more. After a day of typical April showers the atmosphere was very clear with good transparency. Although I stuck with 10 minute subs the transparency later in the evening would have allowed longer exposures. 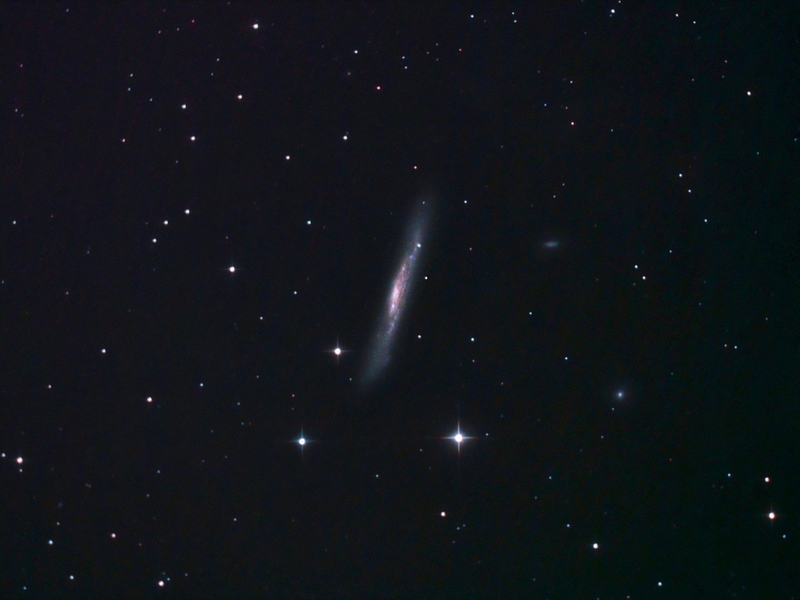 This time I went for spiral galaxy NGC 4559 in Coma Berenices. Details: 10" f4.3 Newt. 15 x 10 minute exposures @ iso1600 with CLS in DSS, FIV, CS2 & XAT. After imaging the pair of galaxies in Leo Minor I moved into Ursa Major for NGC 4051. By now the moon was out of the sky and the transparency was the best I had seen for some time allowing some 10 minute subs and a late finishing session. This galaxy is much studied due to its highly energetic and variable emissions. Details: 10" f4.3 Newt. 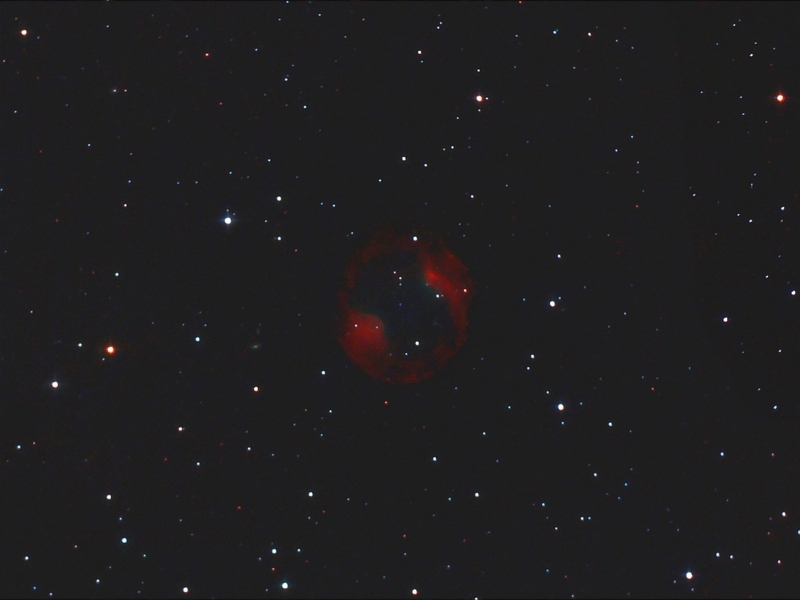 15 x 10 minute exposures @ iso1600 with CLS in DSS, FIV, CS2 & XAT. When a night arrived with noticeably better transparency I looked forward to the next session. I was once more in "beat the moon" mode as it gets higher in the sky. However, after having enjoyed a good run of reliability with my equipment I was dismayed to find the declination drive had ceased to function. It was obviously slipping on the drive shaft but curing the problem in the dark proved frustratingly elusive. I was forced to abandon for the night and wait for some daylight when I could see better what had gone wrong. A disassemble and screw replacement put things right so I was ready for the following evening when the good transparency had held though the moon was an increasing problem. I found this pair of NGCs in Leo Minor but had to wait for the moon to get lower before getting some useable subs. Fortunately the declination drive was back to normal. 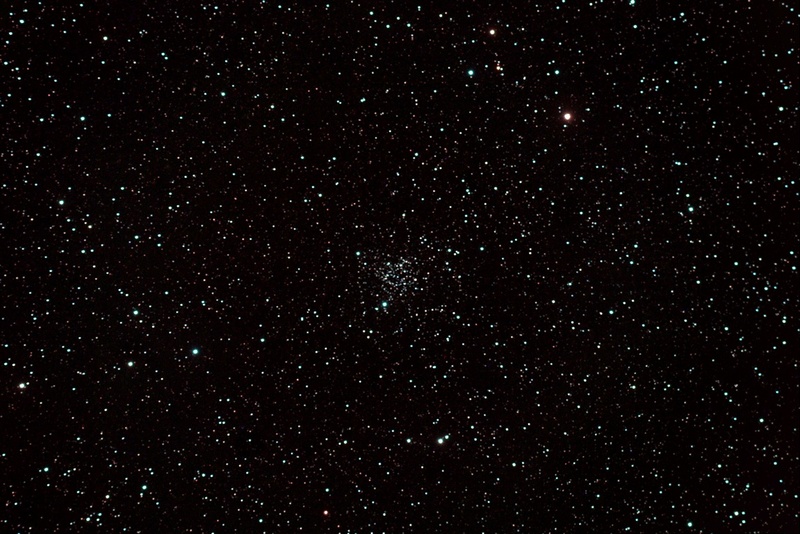 Upper left is NGC 3304 and lower right is the somewhat more interesting NGC 3294. Details: 10" f4.3 Newt. 12 x 8 minute exposures @ iso1600 with CLS in DSS, FIV, CS2 & XAT. Though a run of clear nights continues good transparency seems elusive due to some typical river valley mistiness. Still in Leo my next session found this group of near face-on NGCs. The exception is the faint PGC 35362 at upper left. The NGCs (top to bottom) are 3686,3684,3691,3681. Details: 10" f4.3 Newt. 14 x 8 minute exposures @ iso1600 with CLS in DSS, FIV, CS2 & XAT. 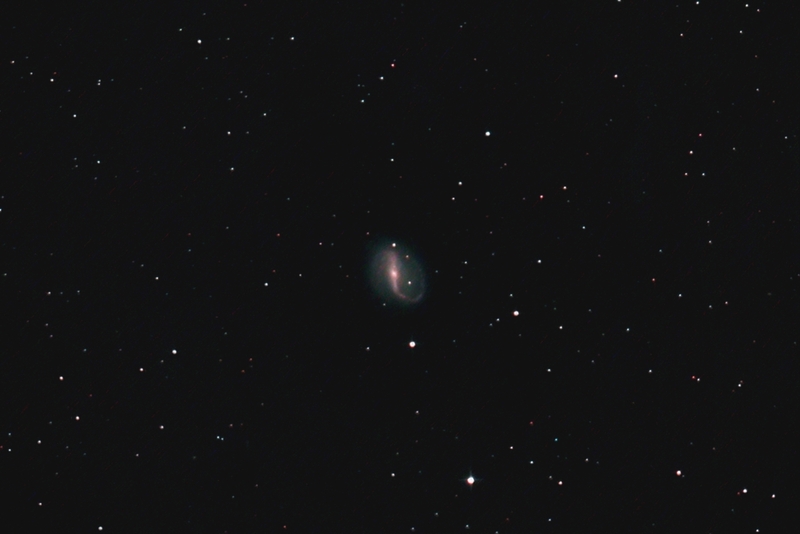 The previous evening I had started to image the very spherical galaxy M 105 but conditions prevented me getting beyond just a few subs. After imaging the supernova I returned to M 105 to obtain a few more subs to add to the total already acquired. 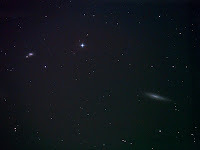 I didn't have to move the scope very far as M 95 is very close to the M 105 group in Leo. The other pair of bright galaxies are NGC 3389 at lower left and NGC 3384 in the centre. Details: 10" f4.3 Newt. 14 x 8 minute exposures @ iso1600 with CLS in DSS, FIV, CS2 & XAT. 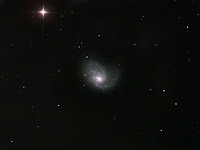 An unexpected surprise in the last few days is the appearance of a supernova in M 95. 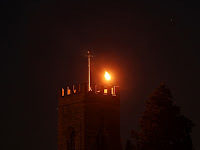 I am indebted to Simon Edwins for alerting me to the event which allowed me to attempt an image of it last night (21/3/12). Designated SN 2012aw it is quite bright and I would guess it should be detectable through the eyepiece of a modest scope. 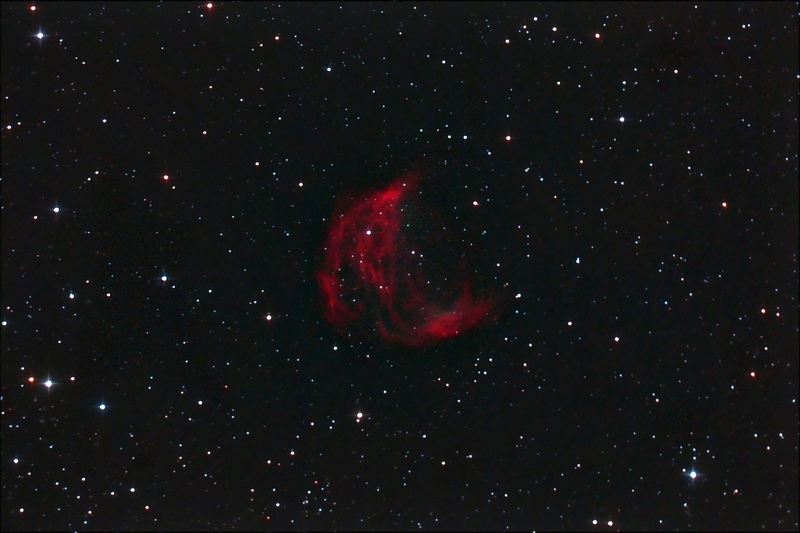 The transparency was much affected by a misty sky that prevailed throughout the evening but the clouds stayed away and I was pleased to add another supernova image to my collection. Details: 10" f4.3 Newt. 12 x 8 minute exposures @ iso1600 with CLS in DSS, FIV, CS2 & XAT. The next opportunity found this trio in Leo. 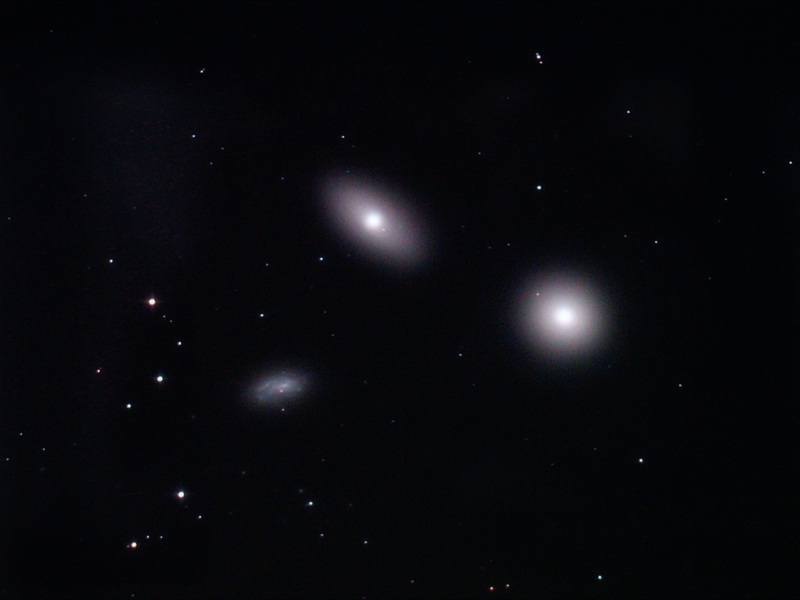 They are (top to bottom) NGC 2970, 2968 & 2964. Transparency was mediocre and the session came to a premature halt when cloud appeared. Details: 10" f4.3 Newt. 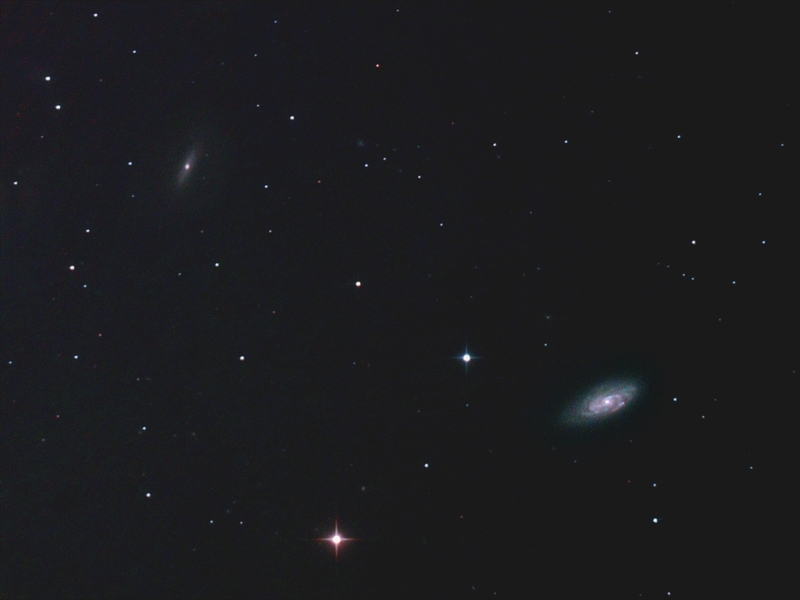 10 x 8 minute exposures @ iso1600 with CLS in DSS, FIV, CS2 & XAT. 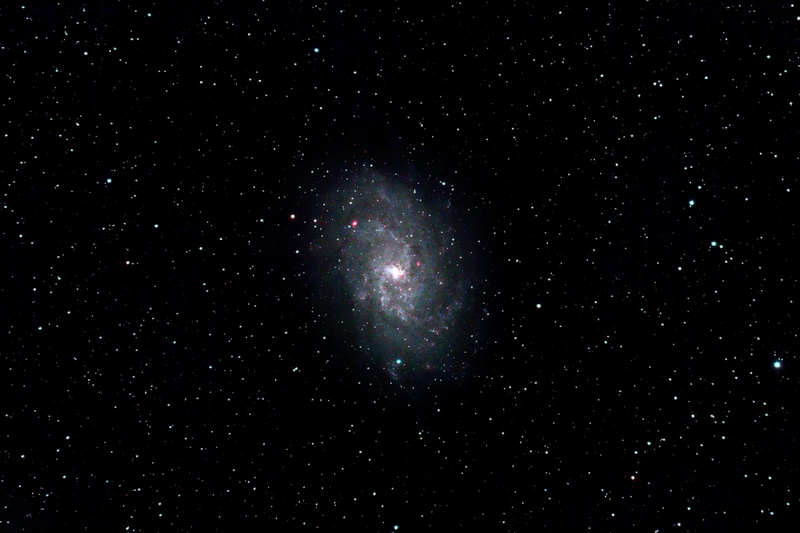 Also in Ursa Major I found the barred-spiral NGC 3079. Like the previous target(s) this was also in my floodlight affected area of sky so no benefit from anything more than 8 minute exposures. 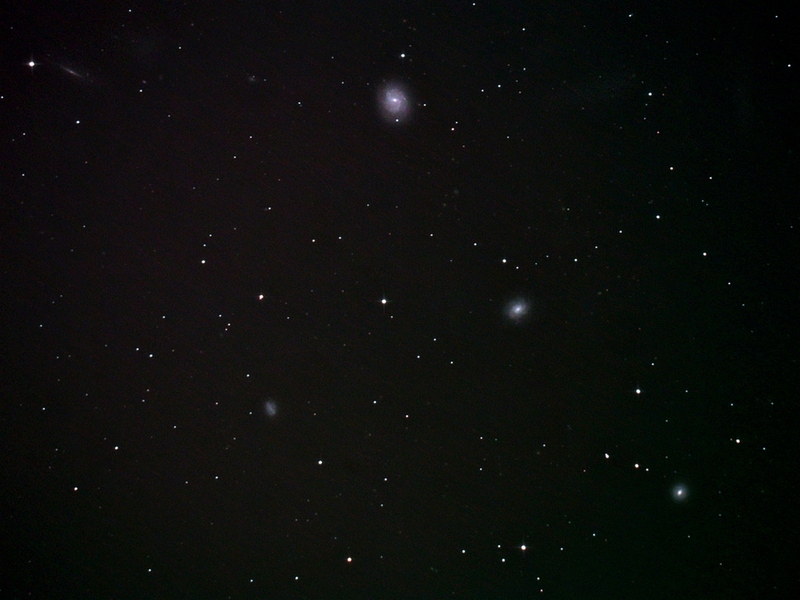 The two faint galaxies to the right are PGC 28990 & NGC 3073. Details: 10" f4.3 Newt. 12 x 8 minute exposures @ iso1600 with CLS in DSS, FIV, CS2 & XAT. As a change from the usual photography my last post reveals I've been playing with some time-lapse sequences. Here is about 90 minutes worth of Orion through twilight from my garden. It reveals quite well how open fires can effect the local transparency! Best viewed at full screen resolution 720HD. Details: Canon 550D with 24mm lens @iso200 with 10 second exposures. 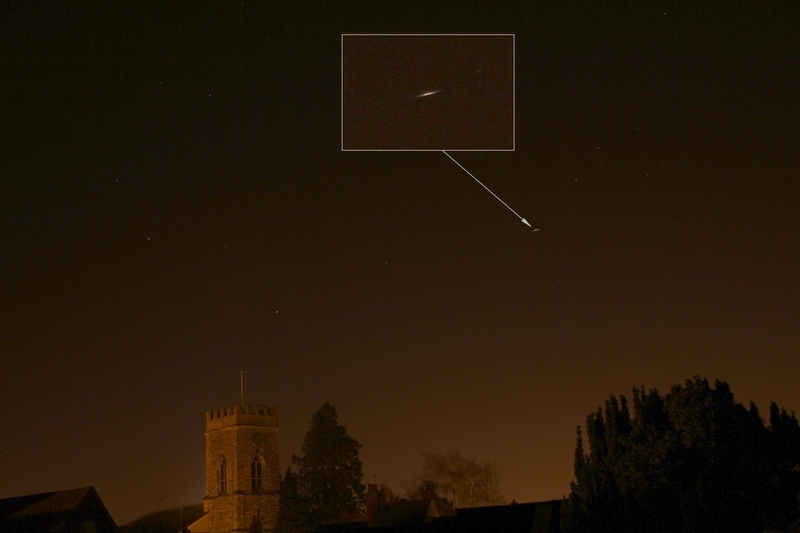 While experimenting with a time-lapse sequence a couple of nights ago this object appeared on one of the frames (each of which were of 10 seconds duration). Not really bright enough for an Iridium Flare so presumably another satellite catching a glint of sunlight. 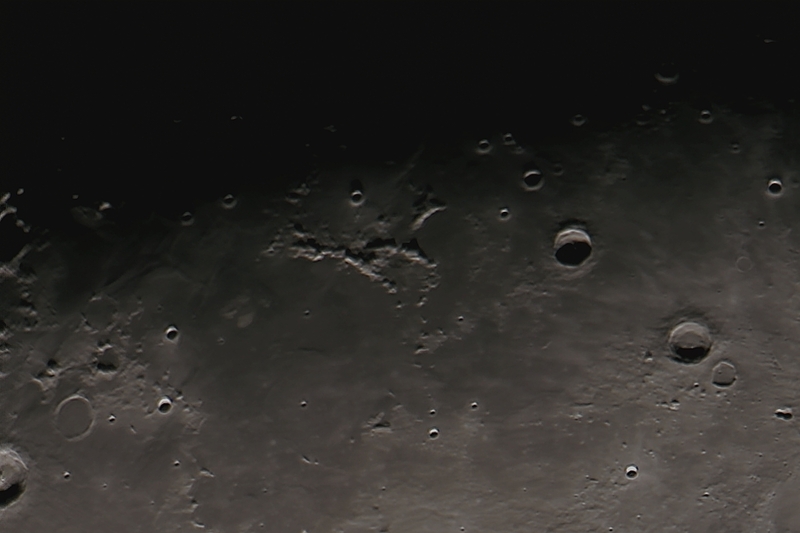 With a rise in temperature it was time to come out of hibernation and attempt some imaging again. During the period of intense cold the sky had moved round a bit with some fresh targets coming into my window. Last year I had noticed this patch of nebulosity but never got to image it. This time around it made a suitable target with a return to the Newtonian. What initially looked to be a good sky didn't have the transparency I hoped for and the fainter areas of the subject escaped me despite some heavy processing. Known as the Medusa Nebula, Sh2-274 is a large planetary nebula in Gemini which was originally thought to be a supernova remnant. Worth another go in better conditions. Details: 10" f4.3 Newt. 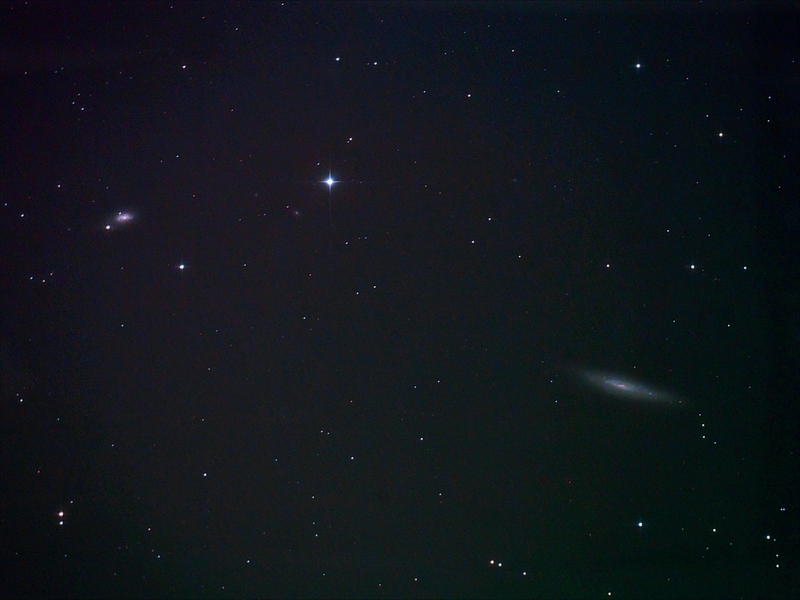 15 x 10 minute exposures @ iso1600 with CLS in DSS, FIV, CS2 & XAT.